After several phone calls informing us that a loved one has passed away; I had to take a leave of absence to get my head & heart right. I think any normal person can deal with 1 or 2 deaths but several?!!! We were beginning to think that there was some evil conspiracy going on! Even though words can't really express how we feel right now; I can say that we're doing much better as a family despite the tremendous hurdles we've encountered. You know that saying that God doesn't put more on you than you can handle? Well, we're beginning to question that just a bit but we're still going strong despite everything that's happening outside our walls. We realize that we have no control over who lives or dies & we're just taking it one day at a time. I myself personally have not attended any funerals since my brothers' and that doesn't mean that I don't care.....I'm just emotionally drained when it comes to that. Honestly, I am still pretty raw inside when it comes to my brother & even though I'm in a much better place emotionally; I alone know my limits and refuse to let *the world* tell me how to grieve for other family members. I'm choosing to remember people in my own way through memories & photos and if they don't understand; well, that's too bad. I have to do things the best way that I see fit & this is how I'm dealing with everything. My husband completely understands where I'm coming from & he appreciates my show of support for him through this very difficult time even though I'm not attending funerals with him. I thank you for sticking with me through my ups & downs and I'm very happy to be able to show a bit of creativity with you today!!! This is beautiful! I love the colors and the design. I am so sorry you are going through all these trials and deaths in your family. I am keeping you in prayer! That is such a nice green thanks for sharing. Praying everything get's better for you. Oh Jackie, my heart goes out to you, do what you have to do, We all show our love in so many ways. I loved the Twist you gave all of us this month, You really made us think. Prayers and hugs to you Jackie during this trying time, hugs and prayers to you and your family. Your card is so stunning and love the soft green colors. Beautiful as always. Jackie, your card is gorgeous. I love the embossing folders and the color choice. I am sorry for your losses. My heart goes out to you and your family. Dealing with death is never easy and everyone needs to grieve in their own manner. Your are so strong! Sending hugs and prayers your way during this difficult time. So glad you have a supportive hubby and God with you as you walk through this all. Your card is beautiful (as always!) I love the soft green and brown combination and those brads are gorgeous! Oh sweetie, my heart goes out to you and you've already had my prayers - but sending more. What a tough space to be in and such an uplifting wife and mom of support you are being right now. You are right, even though the cross to bear is heavy and the burdens are many, He is right there and lifting you along. Thinking of you as you all make this new journey with your son! Now your card - WOW! Just a vision of loveliness - love the elegance that it beholds and a wonderful example of nature :) Love the green, of course, lol! Beautiful work, as always! Hello Jackie. I am so sorry life is throwing so much sadness your way. You are right that you must deal with what you are going through the best way for you. Sending you hugs and prayers and hoping your find happiness in the little things around you. Beautiful card - love they layers and the antique brads are fabby. Jackie, I am very sorry to hear that you and your family have experienced multiple losses this month. Please take care and accept my sympathy. Your creation today is lovely. Huge hugs to you Jackie, I love your card but your strength is so admirable. I am such a people pleaser I forget to tell people NO that is not what is healthiest for me. Jackie, your card is beautiful. Thank you for an awesome challenge. I'm so glad to see you posting and back with our blog groups!!!. All the best, God bless you and your family!!! Hi Jackie, I am sorry to hear of all that you are going through. The Lord will continue to give you strength to press through this. Continue leaning on Him. Hugs. Your card is so pretty. The colors are beautiful together and the textures, I love!! keeping you and family in prayer. My sincerest sympathy - Heb 13:5 "I will never leave you or forsake you". I love this soft, comforting green that is so soothing. Dealing with loses is difficult and I pray God is soothing you just like this green is soothing to the eye, and holding you in His arms at this difficult time in which you find yourself. Hugs to you! Love love LOVEEE your card! such clean and elegant layout with a soft tone to it, and those brads are D-vine !! Beautiful card Jackie! I need to get this stamp set out and ink it up. Your colors are very soothing. That is a very elegant card - so nice! i was starting to worry about where you were and i apologize for not calling! i am so sorry to hear of another loss. i'm here for you ALWAYS.... just a phone call and 20 mins. away. your card is, as always, stunning. 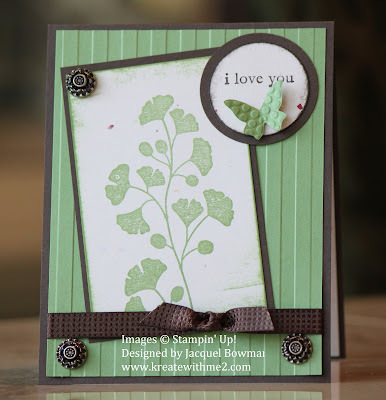 I love the colors and the textures of this card, Jacq. As to the other stuff - Go you! I know the outside world 'thinks they know best' but they can't feel what you feel or see inside your heart. We are individuals and it's up to us to do it our way. Hugs to you, sweetie. And a one for hubby for being ever so supportive. Big hugs and prayers to you and your family! Everyone copes with death in their own way and there are many healthy ways to deal with your emotions. Hoping you find comfort in whichever way you choose to mourn. Your card is fantastic and your son is so fortunate to have such a wonderful and caring mother! So sorry to read of more loss in your lives. You are right to grieve in the way that feels right for you, nobody else. Your card is gorgeous. Soft and lovely. This is so pretty, wonderful colors and I love the butterfly! Such a pretty card. I love the embossing on your butterfly. Hope all is well now.